Holiday Film Preview 2008: Vampires, Superstars & 007… Oh My! 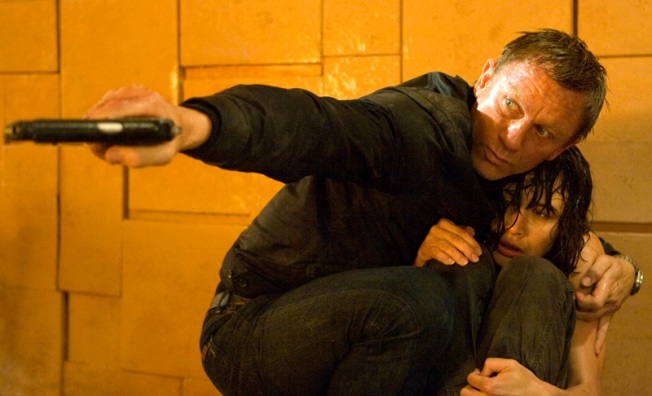 Daniel Craig stars as James Bond alongside Olga Kurylenko in "Quantum of Solace." Nixon’s back. So are Kate and Leo, Nicole and Baz, a herd of stranded zoo animals and a very vengeful James Bond. Despite the harsh economy, Hollywood has been on a box-office roll the last month, and studios head into the year’s homestretch with a solid lineup of returns, reunions and promising newcomers that could uphold the old saw about movies as a recession-proof business. The movie reunites a voice cast led by Ben Stiller, Chris Rock, Jada Pinkett Smith and David Schwimmer as the foursome of zoo buddies, now stuck on a wildlife preserve in Africa after their ramshackle plane crashes. Stiller enjoyed making the sequel more, partly because he wasn’t so lonely in the recording booth doing the vocals. Actors generally work alone on animated flicks, but one pivotal scene between Stiller’s Alex the lion and Rock’s Marty the zebra was recorded with both actors in the room. Among other big films: Daniel Craig returns as Bond in “Quantum of Solace”; “Titanic” stars Kate Winslet and Leonardo DiCaprio are together again in the domestic drama “Revolutionary Road”; Nicole Kidman reteams with “Moulin Rouge” director Baz Luhrmann for the World War II-era epic “Australia”; Kidman’s ex, Tom Cruise, stars in his own World War II tale “Valkyrie”; Frank Langella reprises his stage role as Richard Nixon in Ron Howard’s “Frost/Nixon”; “Babel” co-stars Brad Pitt and Cate Blanchett reunite for “The Curious Case of Benjamin Button”; Keanu Reeves stars in an update of the sci-fi classic “The Day the Earth Stood Still”; and a best-seller comes to the screen with “Twilight,” about a teen’s romance with a studly vampire. Adapted from the first book in Stephenie Meyer’s series, “Twilight” stars Kristen Stewart as the new girl at school who falls for the eternally young bloodsucker (Robert Pattinson) from a family of vamps trying to do the right thing by refusing to feed off humans. Teen girls have been the core audience for the books. But director Catherine Hardwicke figures it’s a story everyone can relate to, even her mom’s 70-something friends. “Quantum of Solace” picks up where 2006’s “Casino Royale” left off, with 007 out to avenge the death of his great love. Bond bounds around the world, going rogue as his quest tosses him up against a phony environmentalist cornering a South American water supply and lands him in the company of a woman (Olga Kurylenko) with her own mission of vengeance. Unlike the always slick Bond of old, Craig again presents an operative with rough edges, who reveals his emotional scars in the downtime between the action. “Four Christmases” features Reese Witherspoon and Vince Vaughn as a couple suffering through the ultimate holiday horror — four separate family gatherings with parents, stepparents, siblings and other kin. The cast includes Robert Duvall, Sissy Spacek, Jon Voight, Mary Steenburgen and Vaughn buddy Jon Favreau. In “Nothing Like the Holidays,” a family copes with upheaval, new additions and old resentments as siblings head home for Christmas at their parents’ place. The cast includes John Leguizamo, Debra Messing, Freddy Rodriguez, Alfred Molina and Elizabeth Pena. Kate Winslet and Leonardo DiCaprio played lovers whose romance wound up on the rocks after the ship hit the iceberg in “Titanic.” With “Revolutionary Road,” they play a couple on another sort of collision course as they try to break free of their stifling suburban lives. Clint Eastwood directs and stars in “Gran Torino,” about a bigoted Korean War veteran who develops unexpected rapport with his immigrant neighbors. “Doubt” features Meryl Streep, Philip Seymour Hoffman and Amy Adams in a moral showdown between a traditional nun and a progressive priest accused of abusing a student at a Catholic school in 1964. Following in the paw prints of “Beverly Hills Chihuahua,” Miley Cyrus and John Travolta provide the lead voices in the animated “Bolt,” a family flick about a dog that plays a superhero on TV but must scrape by on his ordinary canine abilities on a cross-country trek home. “Marley & Me” stars Jennifer Aniston and Owen Wilson in an adaptation of John Grogan’s book about a crazy mutt whose mischievous ways keep him perpetually in the doghouse with his exasperated owners. Michelle Williams puts in a heart-wrenching performance in “Wendy and Lucy,” a drama about a woman who encounters hostility, indifference and the occasional act of kindness after she and her dog become stranded on their way to a new life in Alaska. “Australia” takes Nicole Kidman, co-star Hugh Jackman and director Baz Luhrmann back to their homeland as World War II breaks out. “It was important to all of us, Baz, Hugh and myself, that we be able to go back where we started, at a time when we could go anywhere in the world, and actually choose to go there and tell our story,” Kidman said. Kidman plays a Brit searching for her unfaithful husband in Australia, where she hooks up with a rough local (Jackman) on a cattle drive across the barren landscape, the two ending up at ground zero during a Japanese bombing. Tom Cruise, Kidman’s ex, and Daniel Craig each headline thrillers about fighters opposing the Nazis in Europe. Craig stars in “Defiance,” a tale of Jewish brothers who organize a resistance movement in Eastern Europe, while Cruise plays German Col. Claus von Stauffenberg in “Valkyrie,” a thriller about conspirators who plotted to kill Adolf Hitler. Viggo Mortensen also puts on a German uniform in “Good,” playing an academic gradually seduced into collaborating with the Nazis during the Holocaust. “The Reader” features Kate Winslet and Ralph Fiennes in the story of a young man’s obsession with an older woman, whom he encounters again years later when she is on trial as a Nazi war criminal. Jason Statham returns for “Transporter 3,” as the world’s most-lethal delivery man finds a little romance while escorting a Ukrainian official’s daughter. “Punisher: War Zone” has Ray Stevenson as the new incarnation of the Marvel Comics vigilante, who takes on the minions of a vengeful crime boss. Graphic novelist Frank Miller (“300”) directs “The Spirit,” the story of a resurrected crimefighter (Gabriel Macht) battling a villain (Samuel L. Jackson) with a destructive scheme to achieve immortality. Scarlett Johansson co-stars. Keanu Reeves and Jennifer Connelly star in “The Day the Earth Stood Still,” an update of the 1950s classic about an alien and his robot partner who come to our world with an ultimatum for humanity. “The Curious Case of Benjamin Button” features Brad Pitt and Cate Blanchett in an adaptation of an F. Scott Fitzgerald story that traces the strange life of a man born in his 80s who ages backward toward infancy. Sean Penn stars in the title role of “Milk,” based on the life of gay political pioneer Harvey Milk, who was slain along with Mayor George Moscone by a fellow San Francisco politician. Steven Soderbergh’s two-part epic “Che” stars Benicio Del Toro as revolutionary Che Guevara as he rises to power alongside Fidel Castro in Cuba but fails in a similar guerrilla campaign in Bolivia. “Frost/Nixon” presents the behind-the-scenes and on-camera drama between Richard Nixon (Frank Langella) and British TV personality David Frost (Michael Sheen) amid their historic series of interviews in 1977. With the actors reprising their roles from Peter Morgan’s play, the film is anchored by a brooding, melancholy performance from Langella, who captures the intonation and bearing of Nixon without relying on mimicry or impersonation. In “Bedtime Stories,” Adam Sandler stars as a hotel handyman who inexplicably finds the outrageous tales he spins for his niece and nephew coming true. Jim Carrey accentuates the positive in “Yes Man,” playing a loser whose life takes a positive turn after he adopts a self-help program requiring him to say yes to everything. “Role Models” casts Seann William Scott and Paul Rudd as immature grown-ups who wind up sentenced to community service as youth mentors. “Soul Men” pairs Samuel L. Jackson and the late Bernie Mac as former singing partners trying to put decades of bad blood behind them as they travel cross-country for a tribute concert. The late Isaac Hayes co-stars. A cast that includes Paris Hilton, Alexa Vega of “Spy Kids” and opera singer Sarah Brightman is featured in “Repo! The Genetic Opera,” a musical horror story in a future world where repo men take back transplanted organs if recipients can’t keep up the payments. Will Smith follows his summer smash “Hancock” with the sober drama “Seven Pounds,” playing a man trying to make amends for his past by helping seven strangers. The cast includes Rosario Dawson, Woody Harrelson and Barry Pepper. “Slumdog Millionaire,” the latest from director Danny Boyle (“Trainspotting”), spins the story of a young man (Dev Patel) whose appearance on India’s version of “Who Wants to Be a Millionaire” is the backdrop to reconnect with the lost love of his horrific childhood. Adrien Brody, Rachel Weisz and Mark Ruffalo star in “The Brothers Bloom,” about a pair of con-man siblings, one with a shot to chuck his trade and find the life of romance and adventure he’s always wanted. “Last Chance Harvey” features Dustin Hoffman as a failed jingle writer and Emma Thompson as a statistics bureaucrat whose chance encounter at an airport bar could change both their lives. Mickey Rourke may emerge as Hollywood’s latest reclamation project with “The Wrestler,” Oscar buzz swirling for his performance as a former star trying to recapture past glory in the ring. The story parallels the real-life saga of Rourke, who squandered his early acting promise with years of bad behavior that made him an outcast in Hollywood. Rourke wants “The Wrestler” to prove he’s willing and able to go the distance again.